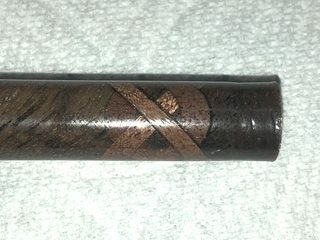 I wanted to try my hand at celtic knot and segmented pen blank making. 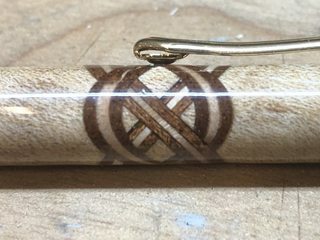 Even though there doesn’t seem to be a huge pen making group here I asked for help over at IAP and got some great advice that I thought I’d share. I had 2 issues that I saw right away. The bottom of my knots were obviously screwed up. Also, there appeared to be “ghosting” around the edges of the knots but I’m thinking that it’s because there is a gap between the insert and the blank caused by the insert distorting the blank which I should have clamped better. 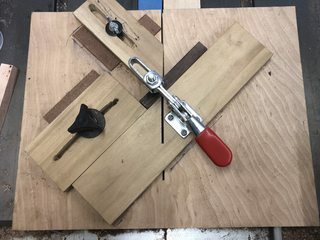 The first suggestion was to abandon the bandsaw jig and use a tablesaw jig instead. I used a 60 tooth trim blade with a flat bottom cut. The bandsaw kerf required multiple cuts to make the slot wide enough which produced an uneven bottom in the slot. After applying medium CA into the slot and onto the infill I then infused it with thin CA and clamped it. I did this for each cut before moving on to the next one. 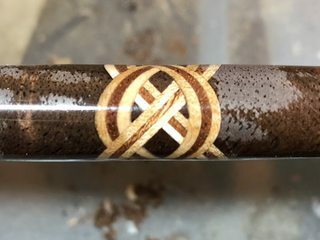 The knot in the first picture below was made without clamping the blank between each process and you can still see a little ghosting around the edges. Then, once I started clamping them that seemed to fix my ghosting and uneven slot bottom issues. I then cut my own thin strip veneer (using solid wood, not commercial veneer) which I glued using CA making sure it was a semi-snug fit that didn’t cause any distortion of the slot. Going forward I will probably make the infill layers using wood glue but was anxious to see the fruits of my labor this time. Not perfect, but getting there. 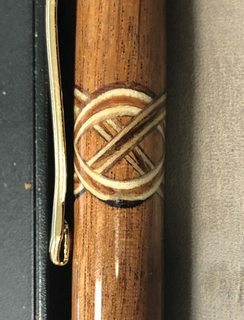 Please excuse the fog in the 3rd picture as I rushed the finish before the tube glue had cured as the goal was to get the knot right, not make a finished pen. I think I have a handle on the technique. Segmenting trials are next. looking pretty good andy.iap is definitely the go to place for pen advise or help.thanks for sharing your info. Those celtic knots look pretty good to me!